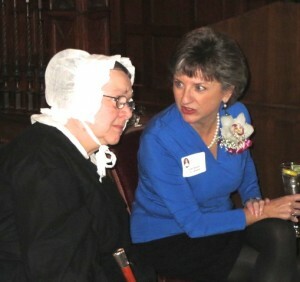 Molly K. Morrison chats with Susannah Brody, playing the role of Rebecca Lukens, at the Eighth Annual Rebecca Lukens Award ceremony in Coatesville. Attired in 19th-century Quaker garb, Susannah Brody provided the voice of Rebecca Lukens, and the elegant Graystone Mansion, built by Lukens’ grandson in 1889, offered a fitting backdrop for a brief synopsis of the pioneering industrialist’s accomplishments. Driven by a promise to her dying husband to keep the steel mill going, Lukens proceeded to demonstrate an iron will that would transcend myriad obstacles, including litigation from her own mother, who deemed her unfit and foolish. But Brody, a Rebecca Lukens re-enactor, cut the dramatic prelude short, explaining that the audience had assembled for a different reason: to honor Molly K. Morrison, the president of Natural Lands Trust and the recipient of the Eighth Annual Rebecca Lukens Award. 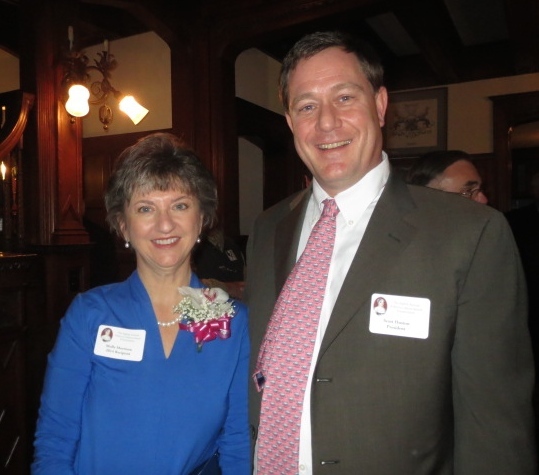 Bestowed annually by the Graystone Society’s National Iron & Steel Heritage Museum in Coatesville, the award goes to individuals who exhibit the qualities of Lukens, a trail-blazing businesswoman who ran the steel mill from 1825 to 1847. The museum recently celebrated her 220th birthday. Molly K. Morrison, recipient of the Eighth Annual Rebecca Lukens Award, is shown with Scott G. Huston, a direct descendant of the trail-blazing industrialist. Among a half-dozen officials and politicians who spoke about Morrison’s career – which began as an intern at the Brandywine Valley Association – a theme emerged: Despite the passage of nearly 200 years, Morrison overcame challenges similar to those over which Lukens triumphed. For example, State Sen. Andy Dinniman described the early days of the county’s open-space movement as an uphill battle. Morrison, who worked for Chester County in positions of increasing responsibility for 21 years before joining Natural Lands Trust, played a key role in the quest to develop and implement the county’s nationally recognized preservation program. “We got killed on trails,” recalled Dinniman, explaining that not everyone shared preservationists’ zeal for a network connecting parks and natural resources. An equally difficult sell was the importance of promoting urban revitalization to balance the open space acquisitions, he said. “She is literally the mother of open space in Chester County,” proclaimed Commissioner Terence Farrell, noting the 1,263 Ches-Len Preserve in Newlin Township that materialized under the auspices of Natural Lands Trust. Farrell said the trust has saved more than 100,000 acres in the region. Surveying the crowd of about 75, Morrison said she was thrilled to see so many people from her past, several of whom commented that they remembered her being pregnant with one or both of her two daughters, now adults. “I guess motherhood is the theme here today,” she joked. On a more serious note, Morrison, a county native who traces her love of the land to visits to her grandparents’ farm in Kimberton, said she has always had “a great affinity for the history” and heritage of the county. She said she was fortunate to have worked with many like-minded professionals and stressed that the work is not done. She said one of the highlights of her career occurred in 1989 when Chester County voters reinforced her passion for open space by approving a referendum that authorized the county to borrow $50 million to preserve farmland and parks in perpetuity. Like Lukens, who nurtured and upgraded her facilities and created the nation’s longest continuously-running steel mill, Morrison oversees another expansive operation. Since its founding in 1953, Natural Lands Trust (and its predecessor, the Philadelphia Conservationists) has saved more than 100,000 acres of natural areas and agricultural lands throughout eastern Pennsylvania and southern New Jersey, making it one of the largest regional nonprofit land trusts in the country. Morrison joined the trust in 2001, becoming its chief executive in 2005. Consistent with that record of accomplishments, Morrison received a plethora of proclamations. The county commissioners, the state House, the state Senate, even the governor weighed in on her contributions to maintaining area residents’ connections to the land of their forbears. “My belief – and the work we do at Natural Lands Trust supports that belief – is that those lands and forests and streams that sustained our forebears are just as critical to future generations,” said Morrison, acknowledging the honor of having her mission linked to that of Lukens. The Graystone Society, created in 1984 to help preserve the city’s historic architecture, is named for the Graystone Mansion, an impressive Collegiate Gothic structure that is part of the Lukens National Historic District, home of the National Iron and Steel Heritage Museum. One focal point of the museum is the 500 tons of World Trade Center steel “trees,” support beams originally manufactured in the late 1960s at Lukens Steel – which is now owned by ArcelorMittal. A historic convoy returned the beams to Coatesville on April 14, 2010. For more information on the National Iron & Steel Heritage Museum, call 610-384-9282 or visithttp://www.steelmuseum.org. To learn more about the work of Natural Lands Trust, visithttp://www.natlands.org.